Determine the number of guests you will be inviting. Find a location suitable for your ceremony. Find a location suitable for your reception. Book a Reverend or Priest. 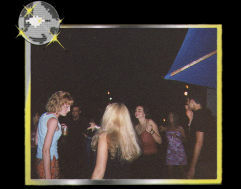 Book Disc Jockey through Adrenalin Island Entertainment 1(877)5-THE-MIX!!! Pick out Bridesmaids dresses, shoes, and jewelry. Inform caterer of the number of guests attending & what they chose to eat. Plan wedding with Disc Jockey (See Reception Planner & Wedding Questionnaire). Disc Jockey should inform Caterer, Photographer, and Videographer of the wedding itinerary & approximate times. Book a limousine for Bride & Groom transportation. Purchase gifts for the entire wedding party. Pick up rings from the Jewelry store. Call to confirm wedding itinerary with all vendors. Bring something to put your money dance cash in. Adrenalin Island Entertainment provides this list to Brides & Grooms in an effort to relieve some of the stress that goes along with planning a wedding. Adrenalin Island Entertainment shall not be held liable for any reason by anyone choosing to use this free planner.